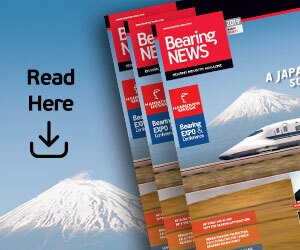 It has been estimated that 60-90% of all bearing failures are lubrication related. Bearing failures most often lead to unplanned downtime which can impact production as well as affect all related components around the bearing. 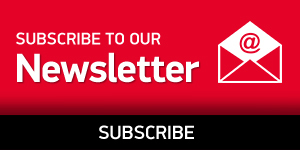 Downtime is costly. Since the most common cause of bearing failure is lubrication related, it’s clear to see that lubrication is serious business. And for the longest time, that “serious business” has been conducted in a way that on its face makes perfect sense – but in fact borders on haphazard. 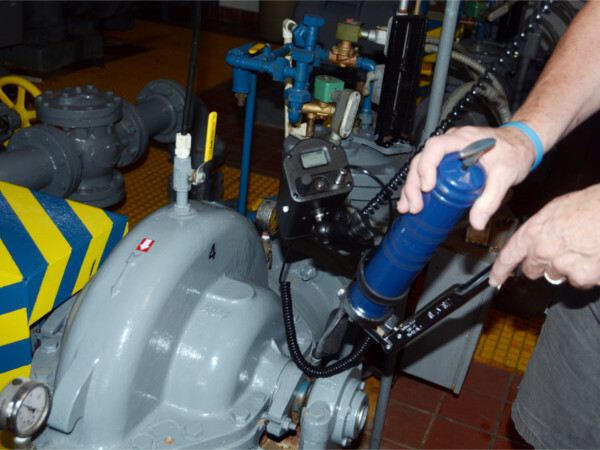 Many technicians, unfortunately, have relied on “preventive”, time-based lubrication alone. That is, every X number of months, the grease gun comes out, and the bearings are lubricated. 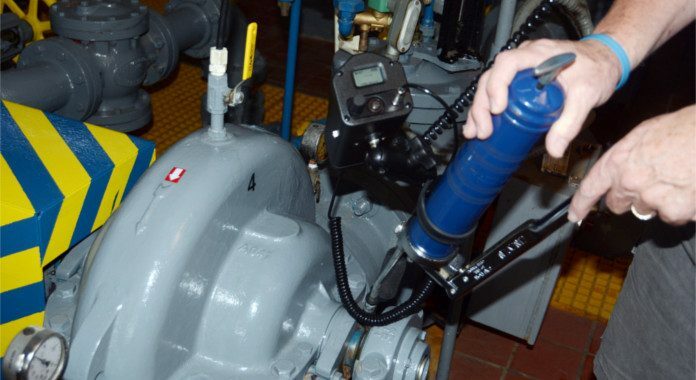 But by relying solely on time-based lubrication, or even a combination of planned maintenance and temperature readings to serve as a proxy for lubrication status, one runs the risk of something just as bad, if not worse: over-lubrication. In fact over-lubrication has been reported both anecdotally and in presentations at various conferences to be the primary cause of premature bearing failure. Relying on time-based, periodic lubrication assumes bearings need to be greased at defined time periods. Often this evolves into a well-intentioned guessing game at best. Adding more lubrication to a bearing that is already adequately greased is a real risk. Ultrasonic equipment detects airborne and structure borne ultrasounds normally inaudible to the human ear and electronically “transposes” them into audible signals that a tech can hear through headphones and view on a display panel as decibel (dB) levels. In some instruments, such as the Ultraprobe® 15,000 Touch, the received sound can also be viewed on a spectral analysis screen. 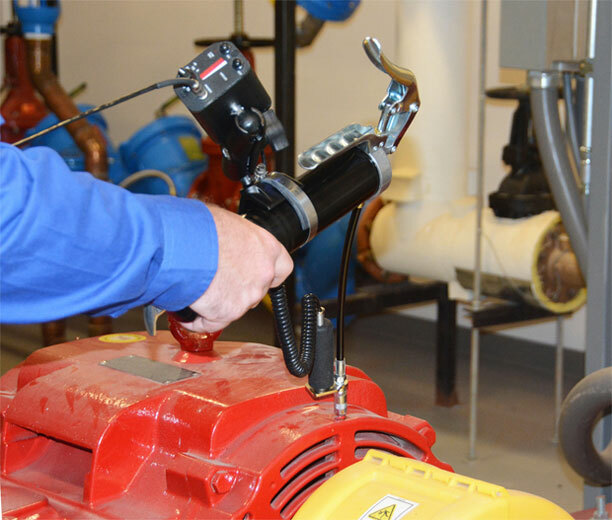 With this information a trained technician can interpret the bearing condition in order to determine what, if any, corrective action is needed. 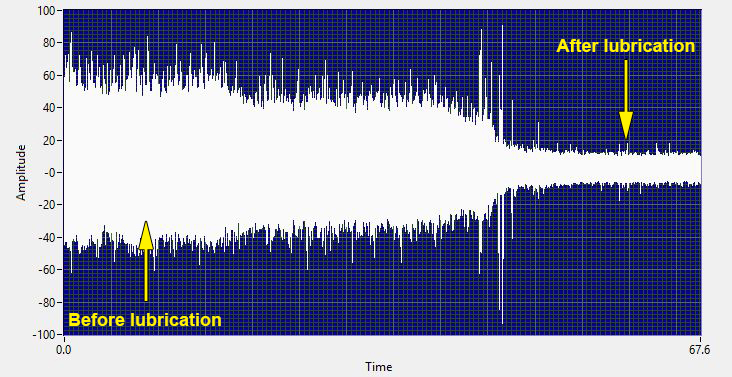 This is a Time Wave Form of a recorded ultrasound of a bearing in the process of being lubed. 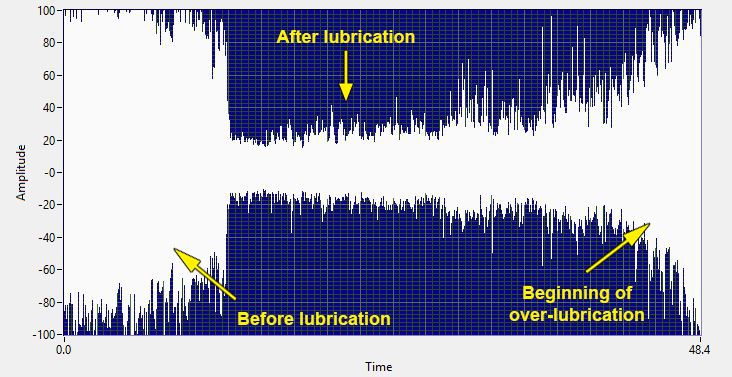 The approximately 1 minute sound files shows the bearing before and after lubrication. 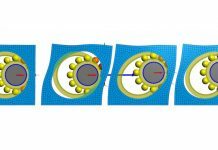 Another Time Wave Form of a bearing in the process of being lubed over 13 seconds. Again, a distinct before and after lube can be seen. 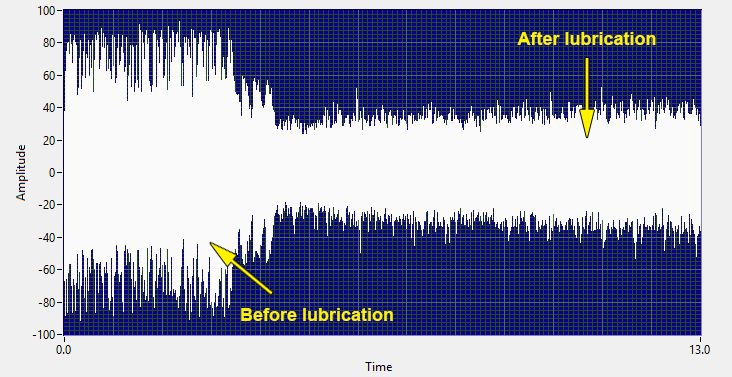 This recording shows the bearing dB & amplitude increase as more lube is added and has reached the threshold of over lubrication. This chart shows a trend of decibel readings taken on a drive bearing. 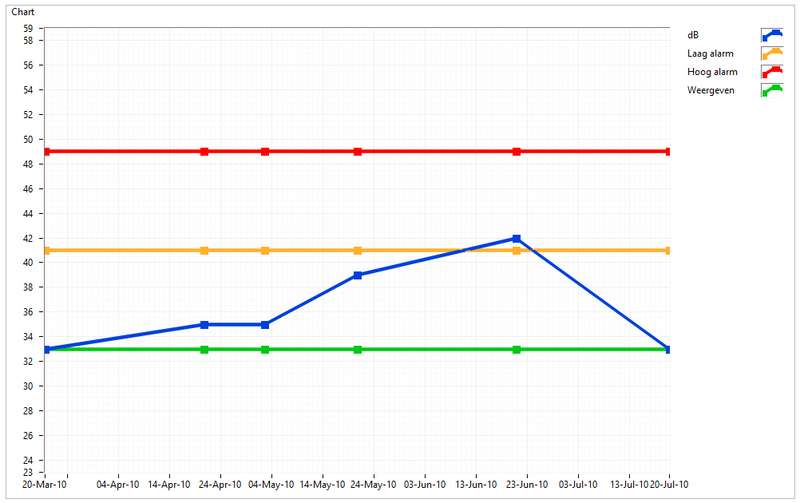 The readings are plotted against a baseline dB, a low alarm dB and a more critical high alarm dB. The first step is to use a proper ultrasound instrument. UE Systems Grease Caddies, for example, are especially designed for bearing lubrication and can even be attached to a grease gun. Then, it is necessary to establish a baseline decibel level and get a sound sample. This is ideally done when moving through a route for the first time by first comparing dB levels and sound qualities of similar bearings. Anomalies will be easily identified. Once established, each bearing can be trended over time for any changes in either amplitude or sound quality. Generally speaking, when the amplitude of a bearing exceeds 8 dB and there is no difference in the sound quality established at baseline, the bearing needs to be lubricated. 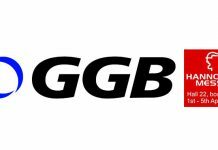 To prevent potentially disastrous over-lubrication, the technician will then apply lubrication, a little at a time, until the dB level drops. To improve efficiency, it is a good practice for the technician to note when the equipment was last greased and how much grease was used to calculate roughly how much lubrication is used per week. 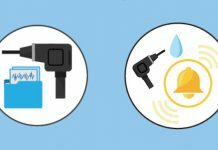 By using ultrasound to lubricate each and every time, the technician produces a historical data that can be used as a guide from previous calculations, helping the department to determine whether the lubrication schedule can be modified, perhaps saving man-hours, and whether the manufacturer’s suggested lubrication amount is accurate (if less is needed, there’s cost-savings potential).